Appointing software provider raises a lot of questions, for example: How to get software service provider being concentrated on your business manifesto? Acknowledging this sort of challenges and dependent upon our years' of experience in software development we characterize Swash approach as: using of Agile strategies upheld by adaptable and customizable Framework of CMMI (level 3) waterfall methodologies. The waterfall model is a subsequent design process, mostly used in software development, where progress is seen as streaming consistently downwards (like a waterfall) through the steps of Conception, Initiation, Analysis, Design, Construction, Testing, Implementation, and Maintenance. This model is likewise called as the classic life cycle model as it suggests a precise successive methodology to software development. This one of the primary model followed in software development. 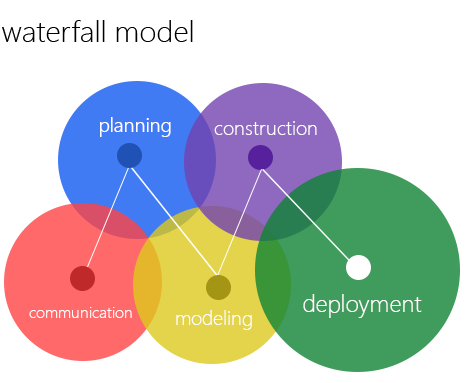 The process starts with the communication phase and then moves through other phases such as planning, modeling, construction and deployment of the product. In this stage the crucial task done is requirement gathering which helps in figuring out real need of the customer. In planning significant exercises such as planning for schedule, keeping tracks on the course of action and the valuation related to the project are carried out. It is also used to find the types of risks involved throughout the projects. Planning portrays how technical tasks are going to happen and what resources are required and their usages. Modeling is one of the vital phases as the architecture of the system is outlined in this step. Analysis is done and based on the analysis a software model is planned. In this phase the actual coding of the software is carried out. This coding is done on the basis of the model planned in the last phase. Hence, software is actually developed and tested in this phase. In deployment the product is delivered & installed at customer's end and assistance is given if needed. A feedback is recorded from the customer to ensure the quality of the software. Once a step has been finished, developers can't move back to the previous stage and make any changes. Waterfall methodology lives vigorously on initial requirements. However, if these requirements are incorrect in any respect, the project is destroyed. If a requirement error is found, or a change supposes to be made, the venture has to start from the beginning with all new code. The entire product is only tested at the end. The plan doesn't consider a client's growing needs. If the client feels that they require more than they initially thought, and ask for a change, the project will delay and affect the budget. When to use waterfall methodology? When there is a reasonable picture of what the final product should be. When clients won't have the capacity to change the extent of the project once it has started. When definition, not speed, is key to victory. 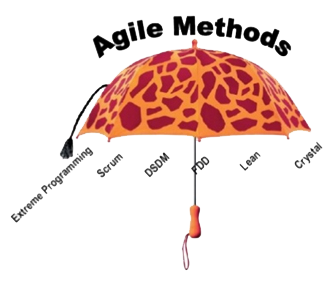 Agile methodology is an accumulation of ingenious, user-friendly means to system development. It tries to characterize the entire system plan rapidly, create and release software faster, and then regularly revise the software product to include extra features. Agile development methodology is a conceptual schema for undertaking any software development project. There are various agile software development strategies but the most prominent are XP and Scrum. In general, agile methods try to lessen risk and maximize productivity. Moreover, it is user oriented and can be an incredible choice when starting a new project. Client satisfaction by fast, nonstop conveyance of useful software. Customers, software developers and testers often communicate with each other. Working software is furnished frequently. Direct and Face-to-face discussion is the best form of communication. Regular cooperation between business people and developers. Continuous reworking to changing conditions. When to use Agile methodology? When quick production is more imperative than the quality of the product. When clients will have the ability change the sphere of the project. When there isn't a transparent view of what the final product should look like. When you have trained developers who are adaptable and able to think on their own. When the product is designed for an industry with rapidly changing standards. Swash's QMS (Quality management system) is led on CMMI (Capability Maturity Model Integration) - Level 3 where many companies are at CMMI Level 1. At maturity level 3, processes are well defined and assumed, and are described in guidelines, steps, tools, and strategies. The company's set of standard processes, which is the foundation for maturity level 3, is created and enhanced over time. These standard methods are used to secure consistency across the organization. Projects establish their defined techniques by customizing the company's set of standard processes according to the customizing guidelines. At this level, the norms and procedures for a project are personalized from the organization's set of standard methods to fit a typical project and hence are more stable. Another crucial distinction is that at maturity level 3, processes are commonly depicted more carefully. At this level, processes are controlled more aggressively using an understanding of the correlation of the process activities and detailed steps of the process, its products, and services. It assists us to keep all courses of action foreseeable, compelling and clear to guarantee that our deliverables meet the customer's demands. We follow a specific agile methodology called "SCRUM" for all of the development and support processes. In the meantime, it is greatly imperative to keep software development methodology coordinated to business requirements, convey most needed results at first, and counter to business response with every delivery. That is the reason why Agile strategy got to be so prevalent – essentially, to pull out the distance between technology and business requirements. Our Scrum Agile model is defined by flexible planning, transformative development and delivery that result in cumulative releases of functional product; hence it provides flexible feedback to new aspects. Our agile project management software aids your professionals get their tasks carried out adequately than before with a streamlined interface, advanced reporting and custom workflows. It helps us to keep all methods certain, successful and precise to make sure that our services or solutions catch up with the customer's needs. Who are using Agile Scrum? We believe that much worth might be attained when CMMI and Agile work in a collective way. The two approaches are absolutely congenial. At the project level, CMMI keeps tabs on what projects really do, while Agile systems concentrate on how projects developing items or products. In addition, as stated in a report, numerous CMMI-endorsing associations additionally have Agile development groups. Then again, companies can successfully present CMMI in an Agile setting where a repetitive, time-boxed methodology is utilized. CMMI and Agile development techniques can supplement one another by making collaborations that can benefit the organization. Thus, What Is Your Methodology? Do reach us for asking your questions on CMMI and Agile techniques, of our project approach and to figure out how you can take benefits from working with Swash.